Mar 1, 2014; Los Angeles, CA, USA; New Orleans Pelicans guard Austin Rivers (25) moss the ball defended by Los Angeles Clippers forward Matt Barnes (22) during the second quarter at Staples Center. LOS ANGELES (AP) — The high-octane Clippers kept on rolling without newly acquired Danny Granger, who will have to wait a little longer to play his first game with them. Chris Paul had 21 points and eight assists, Blake Griffin added 20 points before both All-Stars sat out the fourth quarter, and Los Angeles breezed to a 108-76 victory over the New Orleans Pelicans on Saturday night. Granger could not play because of a technicality on the team’s active list, which is signed by coach Doc Rivers before every game and relayed to the officials. Granger’s name was printed by hand by a member of the public relations staff under the heading: "Updated Roster Additions," but the number on the sheet was not circled along with the other active players by the required deadline of 6:30 p.m. local time. As a result, referee Bill Spooner ruled Granger ineligible and instructed the nine-year veteran to change back into street clothes. The Clippers didn’t need their newest small forward in the wire-to-wire victory, which extended their winning streak to four games and increased their Pacific Division lead to four games over Golden State. "That was on me. I didn’t even notice it," Rivers said. "My job is to check it, so I’m going to have to pay a silly fine that our team has instituted. I don’t know what the amount will be, probably dinner. Fortunately we didn’t need him tonight, and that’s good. "I told Danny I messed up, and he was like: `I’m good, Coach. It kind of gives me another day to kind of get acclimated anyway.’ So he wasn’t that upset by it — but he was ready to play. I can tell you that. And he’ll be ready for the next one." Granger signed with Los Angeles on Friday after his contract was bought out by the Philadelphia 76ers, just six days after the 76ers acquired him from Indiana. His Clippers debut will now be Tuesday night at Phoenix. "The point I’m at now, coming to this team, whatever role Doc sees fit for me is the role that I would do," Granger said during a pregame press conference before knowing he wouldn’t play. "It’s the type of system I will probably thrive in. It’s the system I have thrived in in the past. All the players want to play that way." It was the fourth game this season in which the Clippers’ winning margin was 30 or more points. "We did not come ready to play," coach Monty Williams said. "That is my responsibility, but it is also the responsibility of our team — especially the leaders of our team." Tyreke Evans had 22 points and nine rebounds for New Orleans. But Anthony Davis picked up three fouls in his first 7 minutes on the court and finished with eight points, three nights after spraining his left shoulder in a loss against Dallas. Los Angeles opened a 27-11 lead while New Orleans missed 17 of its first 20 shots. Former Clipper Eric Gordon, who went to New Orleans in the multiplayer deal that brought Paul to Los Angeles, started 0 for 8, and the Pelicans shot 3 for 22 from 3-point range and committed 22 turnovers that were converted into 33 Clippers points. The Pelicans, buried in last place in the Southwest Division, are 8-19 since Jan. 4 and have dropped their last seven. It was the second straight start for Evans, who had been used exclusively in a reserve role this season before Monday’s 116-104 loss at Phoenix. One day after the Pelicans made it official that point guard Jrue Holiday will miss the remainder of the season following surgery in Los Angeles to repair a stress fracture in his right tibia, backup Brian Roberts had four points and missed seven of eight shots. "They come out from the beginning, hit us hard, and we weren’t ready to play," Evans said. "Paul pushed the ball and got it to Blake. We’ve got to get back and do a better job on that." The Clippers also played without Jamal Crawford, who strained his left calf during Wednesday’s 101-93 win over Houston; and J.J. Redick, who hasn’t played since Feb. 3 because of a bulging disc in his lower back. 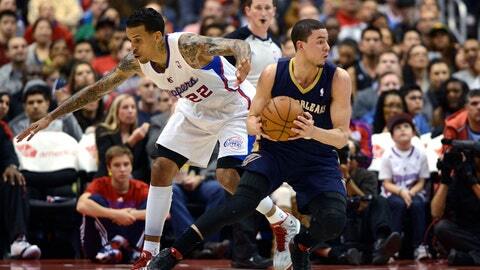 NOTES: Pelicans G Austin Rivers, the son of the Clippers’ coach, had 19 points off the bench. … Granger, who turns 31 in April, was born in New Orleans and played his high school ball in Metairie, La. He was limited to only five games last season because of patellar tendinosis in his right knee, and was sidelined for almost two months at the start of this season because of a left calf strain. … The Clippers have had an least one player with double-digit rebounds in 59 of their first 61 games and each of the last 38. DeAndre Jordan finished with 12. … Los Angeles has won nine of its last 12 meetings with New Orleans after losing 14 in a row.